If there’s one drugstore brand that I’m relatively loyal to it is Rimmel London, although Rimmel London are not as popular as some drugstore brands such as Revlon, in my eyes they’ve created some truly amazing products from the Moisture Renewal Lipsticks to the Scandal Eyes Shadow Sticks. 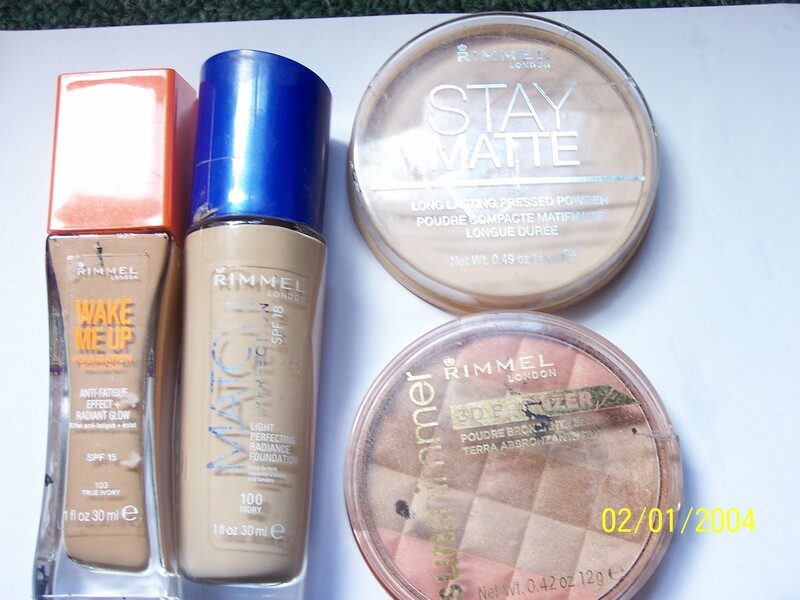 Today I have collected together the Rimmel London products I currently own and am going to share with you which ones are truly great and which ones I wasn’t a fan of. Please bear in mind that certain products I don’t currently own or haven’t yet tried so if you don’t see your favourite Rimmel London products here don’t worry, it just means I haven’t yet used them! I’ve selected five eye products that I own that are made by Rimmel London to talk about with you today and the first is the Glam Eyes Quad Eyeshadow and I have it in Smokey Noir. I’m actually really impressed with this eyeshadow quad, the eyeshadows are really soft and velvety and them blend really easily, they have great longevity and what I love is that on the back of the packaging there is a mini look for you to follow to create the perfect smokey eye. Rimmel London have released these quad eyeshadows in several different shades and I have my eye on the blue eyeshadow one I believe it is called State of Grace. I’m not often a fan of quad eyeshadows but I really like these and would definitely recommend them. A mascara I have that I like is the Rimmel London Lycra Lash Extender Mascara, my sister owns this and I decided to give it a try and I’m really impressed. It lengthens and really curls my lashes but without clumping. The brush is made up of synthetic fibres with a straight brush that is fairly stiff. I found this easy to work with and was pretty impressed by it, I’m not sure if these are discontinued or not but they are available online. This is a product that I raved about when I first got it but I haven’t used much lately and that is the Rimmel London Professional Eyebrow Pencil in Black Brown. This was the first eyebrow pencil that I tried and I found it really easy to work with with a texture that blends easily and has great wearability and staying power. The little brush on the lid of the pencil is cute and is perfect for brushing through brows, I’d definitely recommend this to brow lovers or newbies to brow products. 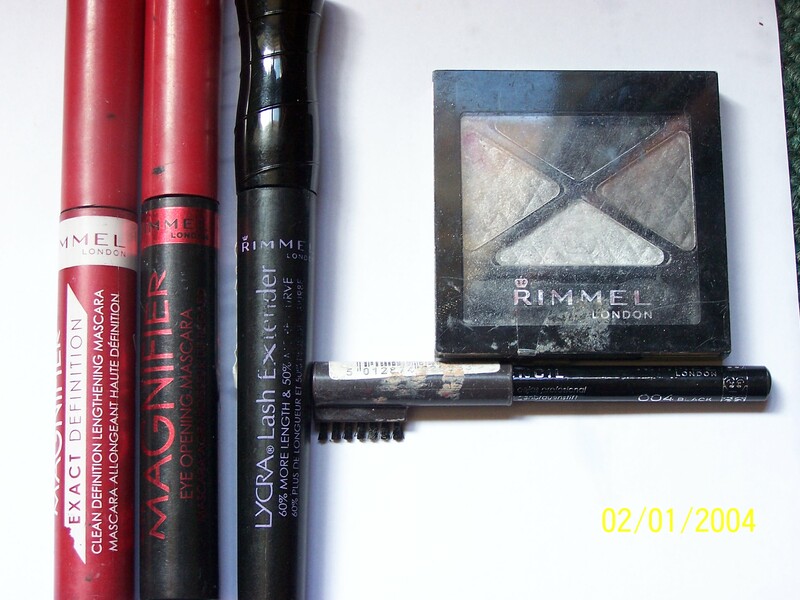 I have two more mascaras which are discontinued and they are the Rimmel London Eye Magnifier Mascaras, the red tubed one is the Exact Definition version and the tubed one is the Eye Opening Mascara. In all honesty I’m not impressed with these, they have a very flexible wand which I don’t mind and the brush is made up of minute plastic bristles. These are supposed to be lengthening mascaras but I feel like the bristles are too short to really lengthen the lash and I found these mascaras to clump on my eye which I was really disappointed with. I believe that both of these mascaras have been discontinued now and I wouldn’t recommend that you purchase them because they just don’t seem to do anything. I have the Match Perfection Foundation which is one of my all time favourite foundations. For me it can be difficult to find a foundation that suits me because I’m very pale and my skin has yellow undertones but the Rimmel London Match Perfection Foundation is great for me. I find that this foundation goes on evenly and offers the perfect coverage for me (medium) but it is buildable. What I really like it that unlike a lot of foundations there’s no worry about tidemarks or having to spend ages blending because this foundation on my is virtually undetectable and it matches my skintone perfectly. I’m really impressed with this and used up an entire bottle of it and I would definitely repurchase. A hyped product which I also love is the Rimmel London Stay Matte Pressed Powder, for me this powder goes on really easily and it doesn’t cake which is really important to me because I have combination skin with dry patches on my nose and cheeks so I need my powder to be as light as possible. This powder is weightless on the skin and I find that the shades are pale enough for me as well. I’m definitely impressed with this powder and it is super cost friendly at £3.99. The first of the worst (see what I did there?) is the popular Wake Me Up Foundation. I really hated this foundation, I’m sorry to all you Wake Me Up Foundation lovers but it just wasn’t for me. I found it to be on the orange side (but to be fair I did go a shade darker), the main flaw with it for me though was how it applied. I applied it with my usual foundation brush and it just went on really cakey and unevenly, it would go on orange and then some parts it would be thick and some parts thinner, when I blended it in it would go paler but the unevenness of it all meant that I had to kepp going over the same parts of my face to get it to go on and I just wasn’t a fan of it. The final product I have for the face is a bronzer and I believe that this has been discontinued now because I picked it up wholesale and it is the Rimmel London Sun Shimmer 3D Bronzer in Light. I bought this bronzer with the hopes that I could use it for contouring but unfortunately it is too light for me and takes a while to build up the colour, I find that it is okay for adding a bit of shimmer to my face in the hotter months but I don’t always get a lot of use out of it. I have three lip products to talk about, one of them I love, one of them I’m just not a fan of and one of them I’m neutral about. The first one is the Rimmel London Moisture Renewal Lipsticks, I’ve been using these all year and it seems that they are finally starting to gain some recognition. I’m a huge fan of these lipsticks, the colour range is good, the price is fair, the qualitiy and longevity is good, they don’t bleed or wear away unevenly but what I really love is the texture, these are really silky and soft on the lips and are not drying at all. For someone who wears a lot of lipstick my lips are prone to dryness but I can happily slap one of these on without any lip balm and my lips are fine. 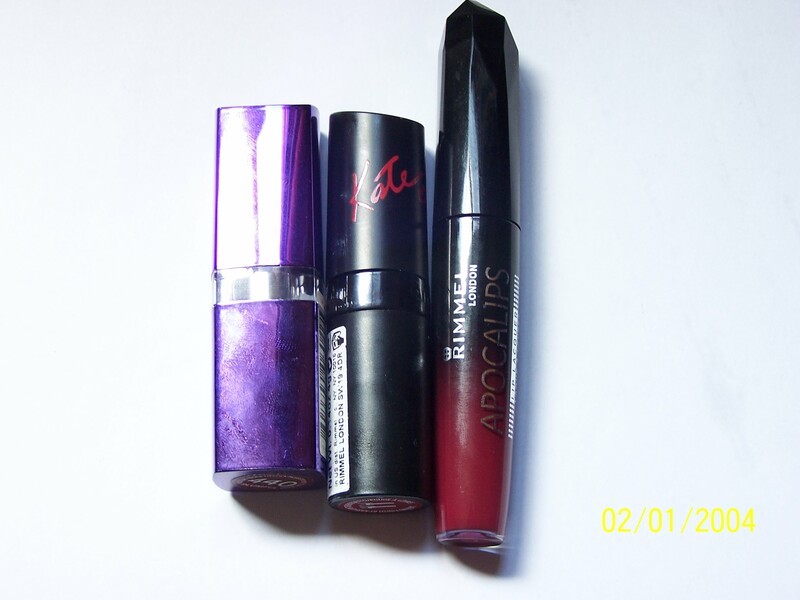 Another product is the Rimmel London Apocalips Lip Laquer and I have the shade Eclipse. A lot of people adore these and a lot of people hate them but I think I’m neutral on them. I love the texture, scent and colour but that do bleed so I would recommend a lip liner with them, I find that they smudge easily so I have to be very careful with them but I do love them as a liquid lipstick and am still quite impressed with the pigmentation and the glossy finish. The second lipstick in the black packaging is the Rimmel Kate Lasting Finish Lipsticks. I’m really not a fan of these I have the shade 11 and I just found that although it was a nice colour it bled really badly and it wore away unevenly so I’d have random patches of red on my lips and random patches where I’d have no product on at all, I found that these were really tiresome and that I needed to constantly reapply them, I was really unimpressed. 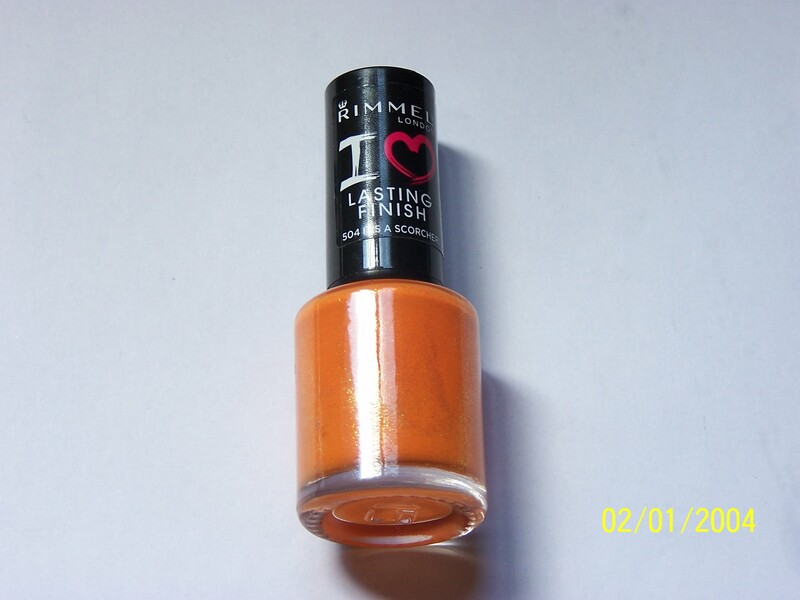 I have one polish and that is the Rimmel London I love lasting finish nail polish I have the shade It’s a scorcher and I’ve also used Black Cab. I don’t think there’s anything particularly good or bad about these polishes. The formula is fine not too watery and the brush is just a standard nail polish brush, they don’t last particularly long but they don’t chip straight away either, personally I prefer Barry M for nail polishes over Rimmel London but these ones are not bad so again I’m pretty neutral. So there is my overview of the best and worst by Rimmel London, I know that there’s some products that I haven’t included but I wasn’t going to buy every product by Rimmel London ever so sorry about that. I hope you enjoyed this post if you did please hit the like button and let me know what your best or worst Rimmel London products are in the comments! This entry was posted in Random and tagged apocalips, beauty, bronzer, foundation, glam eyes, kate moss, Makeup, mascara, matchperfection, moisture renewal lipsticks, nail polish, ninarossbeauty, rimmel london, show off, smokey eyes, wake me up. Bookmark the permalink. I really like some of their mascaras although I haven’t tried them all.